US political rivals are cautiously optimistic about the chances of raising the $14.3tn (£8.7tn) debt limit by Tuesday and averting possible default. Republican Senate leader Mitch McConnell said the sides were "very close" to a $3tn deal after talks with Vice-President Joe Biden. Senior Senate Democrat Richard Durbin spoke of "a more positive feeling". But both the Democrats and the Obama administration warned that the details had still to be agreed. America limits by law the total amount of debt its government can run up in order to pay its bills, and the Obama administration is under mounting financial pressure. According to the Associated Press news agency, a compromise plan now emerging would increase the debt limit in return for spending cuts of about $1tn initially. A joint committee of members of Congress would then decide a larger package of cuts as the price for a second raise in the limit after next year's presidential election. In a sign of the level of anxiety over the issue, troops in Afghanistan asked Adm Mike Mullen if they would be paid. The admiral, who as chairman of the joint chiefs of staff is on a visit to southern Afghanistan, said he could not tell if the US failed to raise the debt limit. I suspect the difficult thing will not be the leaders sealing a deal but selling it to Republicans in the House, and perhaps Democrats in the Senate. "We have to get this solved," White House senior adviser David Plouffe told NBC television on Sunday. "Today is obviously a critical day." Democratic Senator Chuck Schumer said many issues still needed to be settled, although there was "relief" in Congress and the White House because serious negotiations were now making headway. Democrats and Republicans have so far rejected each others' proposals in the two houses of the divided US Congress. 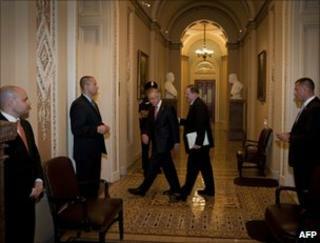 On Sunday, the negotiations appeared to move on a step when the Democrat-dominated Senate narrowly rejected the debt ceiling bill proposed by the Democratic Senate Majority Leader, Harry Reid, and backed by President Barack Obama. The bill would have cut $2.2tn from deficits and raised the debt ceiling by $2.7tn, meaning the issue would not have to be revisited until after the 2012 elections. But its defeat paves the way for a cross-party bill which will probably feature elements of the Reid plan, analysts say. "The arrangement that is being worked on with the Republican leader and the administration and others is not there yet," Mr Reid said on the Senate floor after the vote. "We're hopeful and confident it can be done." The Republican-held House of Representatives rejected the Reid bill 246-173 on Saturday afternoon. House Republicans had passed their own plan, drawn up by speaker John Boehner, to make some $900bn in spending cuts and raise the debt ceiling by a similar amount. But the Boehner plan would require another vote next year, in the midst of the presidential election campaign, and proposes a so-called "balanced budget amendment" to the US constitution. The White House and the Senate leadership are opposed to both of these proposals, and the Boehner plan was rejected, in turn, by the Senate. Speaking on CNN on Sunday, Mr McConnell said negotiators were "very close" to striking a deal. He earlier called on Democrats to end their "charade" so that negotiations could be pursued with the president. "We are now fully engaged with the one person in America out of 307 million people who can sign this bill into law," he said before his talks with Mr Biden. Mr Obama himself has reiterated that any solution must be bipartisan. "Congress must find common ground on a plan that can get support from both parties in the House and in the Senate, and it has to be a plan that I can sign by Tuesday," he said. Meanwhile, the US Treasury is already drawing up emergency plans in case a deal is not reached by Tuesday. Experts say the government has enough cash to keep functioning for another week or so after that.